Yes, I’m posting a comforting soup recipe in May. In my defense, it’s going to be in the 50’s all week and rainy so I deemed it appropriate. I love soup recipes and I make them often. Panera bread is kind of my go-to place when I go out to lunch during the week. Being the creature of habit that I am, I alternate between the Broccoli Cheddar Soup and the Chicken & Wild Rice Soup. 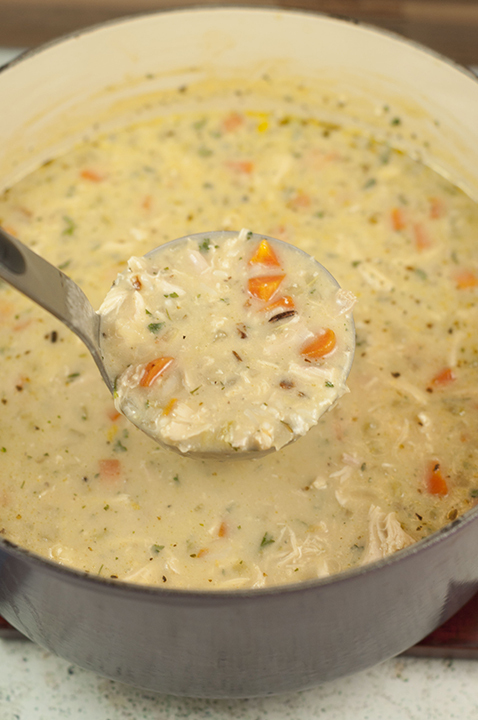 This Chicken & Wild Rice Soup is what I make when I’m fresh out of snacks. Back in 2012 when Mr. Wishes and I lived in Miami for six months, I went to Panera Bread every single day for lunch. I wish I was exaggerating, but I am not. It was someplace I could walk to and sit for hours doing work on my laptop without looking out of place. The employees there got to know me and knew my order ahead of time after a while. One of Mr. Wishes’ favorite stories was how one day I was sitting in Panera Bread in Miami and I had the tomato soup. I called him up while he was at work because I thought I was having a heart attack. I literally thought I was going to keel over right there in that booth. He actually left work to come help me and I called him back a few minutes later to tell him it was just heartburn. Ha! It was really scary though. I already have a copycat version of Panera’s broccoli cheddar soup and I thought it was about time that I learned how to make my other favorite at home. I could eat soup for every meal, much to Mr. Wishes’ dismay. How can anyone be a soup hater? This one has meat in it so it didn’t torture him as much as soup normally does. The seasonings in this soup are just right and the creamy texture is spot on. It is perfect for chilly weather but not too heavy at all for the warmer weather. I may never have to go to Panera again after tasting this! But, I will….nothing will ever stop me. Not even a tomato soup-induced heart attack. I also love this Creamy Butternut Squash Soup from my friend Sandy. Check out my how-to video of me making this Copycat Panera Chicken & Wild Rice Soup recipe! Copycat Panera Chicken & Wild Rice Soup is simple, hearty, creamy, and tastes just like my favorite soup at Panera Bread! It's light enough for the spring and summer months. 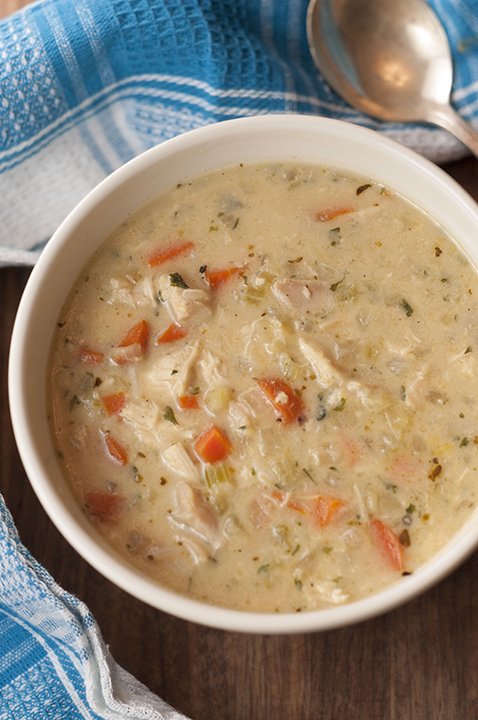 Chicken and wild rice soup is in constant rotation at our house, even in the summer months! Your recipe looks similar to the one I make, except I take a shortcut and use rotisserie chicken. Thank you for sharing this with us! I hate spending money on buying soup because I know I can make a huge batch for a lot less at home. And I love a good copycat recipe. This looks delicious and kudos for recreating it! This is one of my all time favorite soups! Can’t wait to try it out! Wow! That must have been scary! Good on Mr. Wishes for coming to help you, even if it was just a little heartburn. Panera does have the best soups. I’m sure this one is no exception. I’ve never eaten at Panera but I love wild rice soup – sounds so good! We love soup! And although it have it much more often during cold weather, we make it throughout the year. Maybe just 2 or 3 times a month in the summer rather than 2 or 3 times a week. 🙂 Anyway, this looks terrific — our kind of recipe. Thanks! I’m still wearing long underwear and a long winter coat so I’m cool with this. 😀 Looks awesome! Do you know if this can be done in a crock pot and if so how long? Any differences? I would say it could work maybe 5-6 hours on low? Gotta give the veggies time to soften. I would also leave out the oil since you’re not browning the onion/celery, etc. You’ll love it!! Everyone seems to 🙂 Thank you!! Would you put the rice in at the beginning? I’m worried about over cooking it. Thanks. If going the crock pot way, would you say to put in the rice a roni half way thru as well as the milk and flour mixture? Thank you-making this tomorrow! I would say that’s about right because you don’t want it too mushy! Ok great! Thank you for your quick response. Started this in the crock pot a few hours ago and my home already smells delicious! Eagerly awaiting dinner time!! Everyone raves about the soup! Enjoy! Just using a gluten free flour should suffice. Cup for cup is a great GF flour I’ve heard. Use a GF flour or corn starch and you cannot use rice a roni. I use Zatarans long grain and wild rice. I’m a celiac. Just read the label to double check ???? This is a lovely recipe! I could eat this summer or winter. Panera is a favorite of ours! If I don’t want to use the spice packet in rice a roni, what spices should I add to make up for it? Can I ask why you don’t use the spice packet in the rice a roni? It’s just nice to be able to control what goes into your food. Some are watching salt or sugar intake, while others (like me) don’t want the MSG, preservatives, and other additives that are in that packet–there are a lot of iffy ingredients, if you read the box. I found a recipe for the seasoning. It makes a big batch–you can use it with homemade rice, potatoes, etc., but you only use one tablespoon of it for the box of rice. I’d like to know this too! I couldn’t find Rice a Roni at my grocery store, so I had to just buy long grain and wild rice (with no flavour packet). 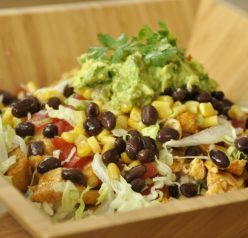 I made this tonight– easy and delicious! I would say 6-8 depending on whether it’s served as a main course or not. Yes, you can definitely freeze this. Delicious soup! Everyone in my family just loved it! This is my favorite Panera soup! Does it matter what kind of milk you use? Is 1% okay? Yes that’s totally fine! Thanks Andrea! 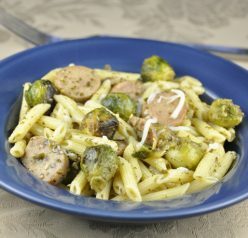 Made this tonight for dinner with rotisserie chicken and it was a huge hit! I will definitely be making this again and again. Thank you Crystal!! So happy to hear it. Does the pot need to be covered while the rice is simmering? Just tried this soup and it’s awesome! What flavor and it’s so creamy – just down right yummy! Will surely make this over and over. I love this recipe! I’ve made it several times. 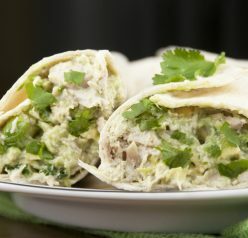 Today, I tried making this with whole wheat flour and doubled the veggies. Still delicious. Next, I’m going to try brown/wild rice with another poster’s seasoning suggestions to substitute for the Rice a Roni. To make a lot more I need to make a larger portion. Do I just double everything in the ingredients? Yes just double everything. Enjoy! What can I sub the milk with? Cream, half and half, non-dairy milk? Anything with the same consistency. I’m not one to usually leave comments but I do always read them. Everyone loved this soup. I am also bad to tweak everything but I stuck to this and it turned out it great. Recently my mother broke her ankle and I am on double duty cooking for my dad. He is not a meat eater so I made this substituting mushrooms for chicken and was equally fantastic! STill a big hit with the meat eaters. Ashley, this soup was incredible and SO easy. Thank you! Can I freeze this soup and reheat it?? Ok, thanks for the reply! I’ll be trying it today! This soup was so good and so easy to make. Yum!!! Made this last week and my husband couldn’t stop raving about it. So delicious and hearty. I want to make it again tonight but am out of milk, though I have some half & half on hand… do you think that would make it too thick? Should I just stick to milk? I’ve never had theirs but, I know homemade is better, always. Always a family favorite as it s so easy to make. Wild rice is so underrated, and this is such a great way to use it! This soup is delicious! I’m going to cook some up for this weekend during the big storm! I just had lunch at Panera today. Ha! Love this soup. A long-time favorite! I never seem to make it in when they serve this. I can’t wait to try! I’m going to make this all winter long! Just made this. DELICIOUS!!! !Thank you for sharing! Hi! This looks so yummy. Is it a really runny soup? Could I maybe leave the cup of water out or less of something to make it a tad bit thicker? Sounds weird, I know.. because its soup. But I like soups that are maybe like the consistency of.. stew or something…. ? Thanks! It’s not runny at all but you can leave out some liquid to make it thicker! This soup is absolutely delicious! Probably the best soup I’ve made in a while. I did add an additional box of rice with only adding an extra 1/4 cup of liquid. I used half and half.. I will definitely make this again.. sooner rather than later ???? I made this soup last night using a rotisserie chicken and served it with fresh baked Italian crusty bread. I also doubled the recipe so we would have leftovers for the week and it turned out delicious. Everyone went back for seconds! I will definitely be adding this recipe to my winter rotation. Is it just me or is the written recipe missing when to add the rice? I love soup, and I am a sucker for a delicious copycat recipe I can make at home. The last time I went to Panera I wanted to try their chicken and rice soup but decided on another. I can’t wait to try this. I want to double this and then freeze it. Can I put this frozen into a crock pot and just leave it several hours; I wanwt to serve this at a ladies’luncheon. Thank you for any advice. Yes, I don’t see why not. Just make sure you give it enough time to unfreeze. I just made this recipe and it turned out amazing, thank you!